I've never been one to crave beets. I've never even been one to particularly like beets. I just kind of tolerated them. But now this has totally changed. Every other week, I get a delivery of organic fruits and veggies from a company called Boston Organics. It is a great way for me to get more fruit and veggies in my diet. One week, in the delivery, we got a delivery of beets and beet greens. I really had no clue what to do with them. I never made beets myself before and didn't even know what my preferred method for eating them was. I decided I would try to roast them. While it took way longer than I was expecting, I really enjoyed putting them on my salads. Then a couple days later, my dad came home with something called Love Beets, and I really did fall in love. They were the perfect size for snacking, and that's what I did. I also used them in this recipe, but you can also roast your own beets or prepare them in any other way. To roast, just rub the scrubbed clean beets with some olive oil and salt and place in a foil packet in a 375 degree F oven. When the beets are done roasting, you should be able to pierce them with a fork. I would start checking for doneness around 30 minutes, but it can take upwards of about an hour. The skin should come off easily when done. I found this dish to be filling enough for a main meal, but you can also make it smaller for a side dish. 1. To make goat cheese, cut it into 12-16 slices and flatten into disks. Combine breadcrumbs, salt and herbes de provence in a small bowl. Put egg white into a small dish and dip goat cheese disks into egg white, then into breadcrumb mixture. Place onto a cookie sheet and repeat until done. Place cookie sheet into the freezer for at least 15 minutes. 2. Heat a skillet with nonstick cooking spray. When hot, brown goat cheese for about 2 minutes on each side; keep warm. 3. Assemble salad ingredients and place goat cheese on top. Dress with red wine vinegar and salt and pepper to taste. Roasted goat cheese? Incredible. I need to try this! I have always wanted to try goat cheese, but still haven't. This salad sounds incredible and that cranberry chicken down below looks awesome too! I still can't really get myself to like beets, try as though I might. Though I'm quite a sucker for goat cheese! Mmm. Thanks for the recipe . Your recipes are what inspired me to get back in the kitchen again! Roasted goat cheese sounds absolutely incredible! Crispy outside, melty inside, without the deep fryer? Yes! This salad looks all around delicious! 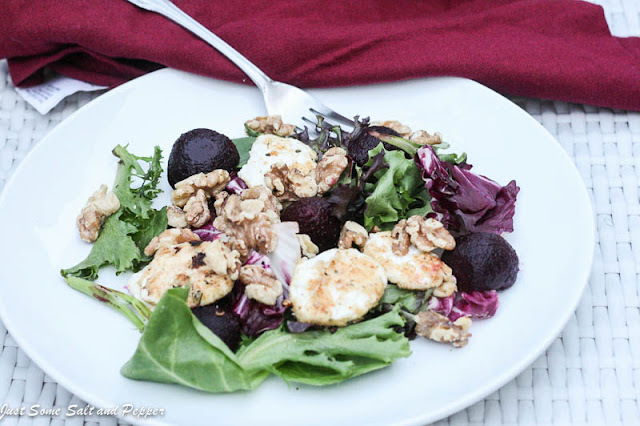 I have never tried goat cheese but I may have to because this looks yummy. Yum fried goats cheese sounds amazing! I love goats cheese! @chefzakir That's incredibly cool for me to hear! Roasting completely changed my idea of beets too, they suddenly turned into something wonderful. Add goat cheese and I'm over the moon! 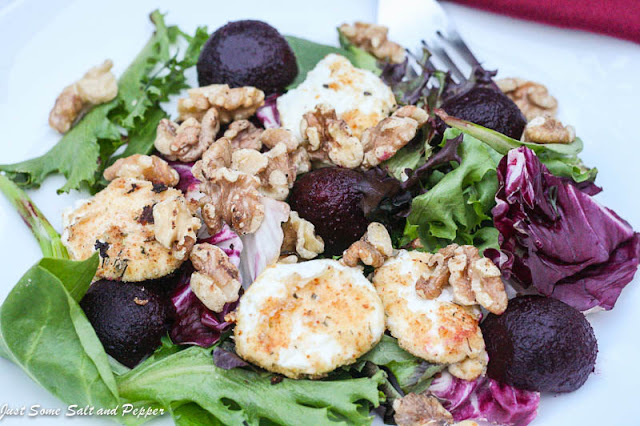 This looks delicious--what a great idea for the goat cheese.